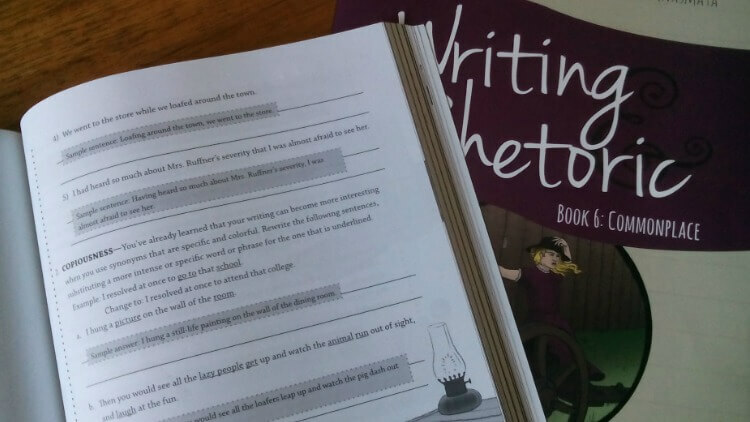 If you’re like most homeschool families, you’ve tried a few different writing programs. It’s one of those subjects that many homeschool moms struggle to teach. We’ve shared that struggle too and have tried our own fair share of homeschool writing programs -- some with more success than others. That struggle ended for us when we started using the Writing & Rhetoric series from Classical Academic Press. Now that we’re halfway through the program with Writing & Rhetoric: Commonplace (the sixth book in the series) I can say we’ve found the writing program that works for us. I received Writing & Rhetoric: Commonplace for free in exchange for sharing my honest opinion of the program. I was compensated for my time spent using and reviewing the materials. All thoughts and opinions expressed are my own. Classical Academic Press is one of my favorite homeschool curriculum publishers. While they do offer those programs you’d expect from a company focused on Classical education (like Latin and Rhetoric) they also offer plenty of other resources -- French, poetry, grammar, Bible study, and of course, writing. Everything they offer follows their motto of ‘Classical Subjects, Creatively Taught’ -- with interesting and engaging lessons and solid teacher’s manuals that will guide you through every step along the way. The Writing & Rhetoric series is clearly a Classical program (but you certainly don’t need to follow the Classical methodology to use the series!). It’s modeled after the progymnasmata which is a method of teaching students to speak and write persuasively. Designed by ancient teachers, it focuses on using a carefully sequenced series of exercises to teach these skills. Classical Academic Press has adapted this ancient methodology and carefully teaches this system in their 12-book series, focusing on one aspect of the progymnasmata in each level. As you progress through the series you’ll recognize how the skills taught in each level get progressively more difficult and detailed. The early books in the Writing & Rhetoric series (see my review for Writing & Rhetoric 3) focus on teaching basic writing and summarizing skills with copywork, narration, and creative writing assignments. Beginning with the fourth book, students begin learning how to write persuasive essays. Each level focuses on a different method. Writing & Rhetoric book four uses famous sayings and proverbs as the foundation for the essays taught. The fifth book in the series (one of my favorites -- so much more interesting than writing boring book reports!) focuses on writing about elements of a narrative. In book six, students take a close look at vices and virtues. 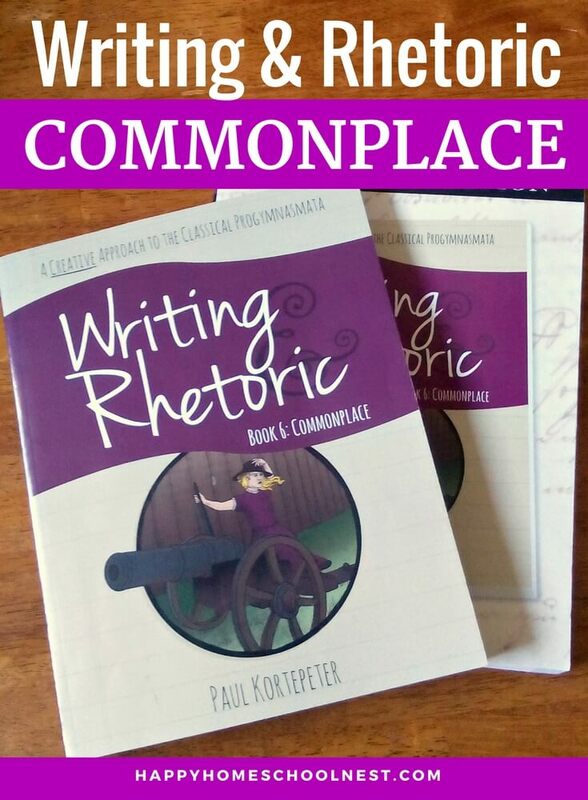 Like the other levels in the series, Writing & Rhetoric: Commonplace includes two books -- a student worktext (assignments are completed directly in the book) and the teacher’s edition. The teacher’s manual replicates the student book with included answers, writing samples, and other notes for the instructor. There’s even a corresponding audio file (which I highly recommend for this level as the chapter text and stories are longer). Commonplace follows the same format as previous books in the Writing & Rhetoric series, with some changes, of course. It goes just a bit deeper, asking for more thought and reflection from students (something that’s expected as kids get older). Students will learn how to craft a solid thesis statement and write a six-paragraph persuasive essay focused on common virtues and vices. The first few chapters focus on thesis statements. Students will spend plenty of time studying well-crafted thesis statement and learn how to properly form their own in the carefully guided lessons. It’s one of my favorite parts of the program. The remainder of the book focuses on writing six-paragraph essays arguing against common vices and in favor of common virtues. Each step is carefully taught to students with plenty of examples and creative assignments. With ten lessons in Writing & Rhetoric: Commonplace, it’s easy to complete this level in one semester and still have plenty of time to include writing assignments in other subjects. Classical Academic Press suggests that students begin book six in fifth or sixth grade (or older). My daughter is using this book in 8th grade and it’s a good fit for her skill level. Once you’ve used one level of this program, you’ll begin to recognize the lesson sections. Every level follows a similar format while assignments get progressively more detailed and difficult as you progress through the series. We’ve found that book six expects more on the part of the students -- something that should definitely be expected as kids gain more writing experience. Lessons are more detailed and assignments take a little bit longer. 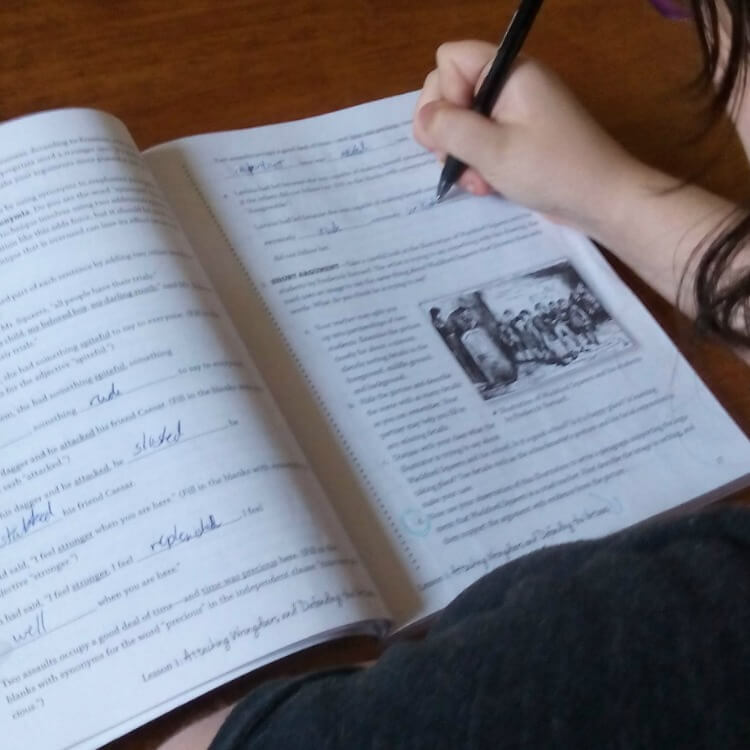 Because of this, and the amount of work in our other homeschool subjects, we take two weeks to cover each lesson in Writing & Rhetoric: Commonplace. Even by making this adjustment we’ll still be able to complete two books in the series this year and have plenty of time for writing assignments in other subjects. Day 1: We read the introduction and story selections aloud (or we listen to the audio version – I really appreciate it for this level) before we begin working on assignments in the ‘Tell it Back’ section. This section includes narration, outlining, annotation, and finding supporting arguments for thesis statements. One of my favorite parts of the program is in the deep discussions it creates for us so we work on this step together. Day 2: We begin our second lesson by discussing the questions in the ‘Talk About It’ section, adding the quotation in the ‘Memoria’ section to our commonplace books and discussing its meaning. We finish the day by working on the ‘Go Deeper’ section. This is another teacher-intensive day for us as we prefer to discuss the material aloud. Day 3: Once we move to the ‘Writing Time’ portion of the text, it’s less teacher-intensive as my daughter works independently. It’s also the longest and most involved section of each lesson so we divide the assignments over three days. During the first day of this section, we focus on the ‘Sentence Play’ segment. Day 4: Another independent work day working through the ‘Writing Time’ section – focusing on the ‘Copiousness’ exercises. Day 5: We move on to the major portion of the ‘Writing Time’ section -- the Commonplace essay (I recommend you have your children type their essay -- it makes editing and revising much easier). Day 6: We go over the notes for the essay to make sure everything is covered and my daughter makes any adjustments to her essay. Have you tried the Writing & Rhetoric series? Writing & Rhetoric really is our favorite writing program. I’m so impressed with the progress my daughter has made. She’s learned valuable skills and a variety of essay formats -- which will serve her well in the future. If you’ve used the series, tell us about your experience -- leave a comment below!